The award, part of a $1.4 billion national funding effort by the Trump administration, will help the state expand medication-assisted treatment for people with opioid use disorder. AUGUSTA — Maine will receive $2.3 million in federal money to support an expansion of medication-assisted treatment programs for opioid use disorder, which continues to claim lives from overdoses at the rate of one a day in the state. Medication-assisted treatment, which combines the use of drugs that suppress withdrawal symptoms with intensive counseling and other social supports, is considered the most effective way of addressing opioid use disorder. Gordon Smith, the state’s director of opioid response, told the Legislature’s Health and Human Services Committee on Thursday that the federal funding could be directed to a number of programs. The federal award represents Maine’s share of $487 million the U.S. Department of Health and Human Services announced it would release nationally through the State Opioid Response grant program. The awards to U.S. states and territories are part of an effort by the Trump administration and Health and Human Services’ Five-Point Opioid Strategy. Together with $933 million in second-year, continuation awards to be provided under the program later this year, the total amount of opioid response grants to states and territories will exceed $1.4 billion this year. The State Opioid Response grants are administered by the federal Substance Abuse and Mental Health Services Administration and aim to address the opioid crisis by increasing medication-assisted treatment with three Food and Drug Administration-approved medications for the treatment of opioid use disorder. The grant award comes a week after Maine Health and Human Services Commissioner Jeanne Lambrew announced that the state would increase reimbursement rates for health care providers who are treating patients with opioid use disorder who are covered by MaineCare, the state’s Medicaid program for low-income residents. 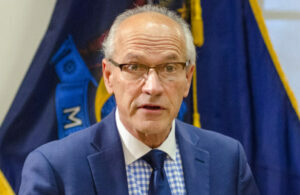 Lambrew said the increases are aimed at creating greater participation among health care providers in the state’s Opioid Health Home program, which critics said was stifled by bureaucracy after its creation in 2017. Lambrew said the hope is that the changes will make it easier for Mainers to obtain treatment services across the spectrum – from prevention through recovery. “This is a big step in the right direction,” said Malory Shaughnessy, executive director of the Alliance for Addiction and Mental Health Services. Shaughnessy said the new reimbursement rates for the Opioid Health Homes program account for the intensity of need when someone first steps into the recovery process, allows for flexibility to maintain other key services they may need for their mental health, and then adjusts as they move into long-term recovery. Opioid Health Homes offers a team-based approach, with services that include office visits, counseling, medication, comprehensive care management and coordination, promoting healthy behaviors and activities, ensuring safe transitions between care settings, and making referrals to community and social support services, DHHS said. There are 22 Opioid Health Homes organizations statewide, providing services at 48 locations, and DHHS said provider participation has increased dramatically in recent months. Since 2017, the homes have served nearly 1,000 MaineCare members and over 300 people who have no insurance. In her proposed two-year budget for 2020-21, Mills included an additional $5.5 million in funding to combat the opioid crisis – $2 million for fiscal year 2020 and $3.5 million for 2021. The funds will pay for existing treatment programs as well as for increasing the weekly reimbursement rate for methadone and repealing the two-year time limit for Suboxone under MaineCare. After Smith’s appearance before the Health and Human Services Committee on Thursday, lawmakers voted to support Mills’ funding request, which includes money to support prevention programs targeting youths. The funding also must be approved by the Legislature’s budget writing committee, which is reviewing Mills’ $8 billion budget. Although the number of opioid overdose deaths appears to be on the decline for the first time in six years, 282 fatalities were caused by all drugs from January through September of 2018. Drug overdose deaths have been rising steadily in the U.S. for several years, but before last year, the increase had been more acute in Maine than in most other states. From 2013 to 2014, when the crisis first took hold, overdose deaths rose 16 percent – from 179 to 208 – the third-highest increase in any state. The next year, 272 Mainers died from overdoses, again putting the state near the top for increases, behind only New Hampshire, North Dakota and Massachusetts. From 2015 to 2016, Maine saw another major increase – 35 percent – bringing the total to 378 deaths. That ranked Maine sixth among all states for annual percentage increase and well above the nationwide increase of 21 percent. And in 2017, there were a record 418 overdose deaths, an increase of 20 percent over the prior year, seventh among states and double the 10 percent increase nationwide. Dr. Elinore F. McCance-Katz, assistant secretary for mental health and substance use at the federal Department of Health and Human Services, said in a statement Thursday that strategies that offer a broad array of services “constitute the gold standard of treatment for opioid use disorders.” McCance-Katz said effective strategies include psychosocial supports, community recovery services and medication-assisted treatment. The federal substance-abuse administration also operates a 24/7 national helpline that people can call to find treatment referral resources for mental health or substance use disorders: 800-662-HELP (4357). People can visit https://findtreatment.samhsa.gov/ to locate those resources, as well.